Hello all friends, this shop sells only handwoven sheep wool fabric in twill weave 2/1, twill weave 2/2, plain weave, herringbone twill (also called Broken Twill Weave) and diamond weave. Fabric and thread can be dyed naturally also or we use natural colour of thread - mostly. Max. width about 135-140cm, after washing. We use hand spun thread and machine spun wool thread. We can weave fabric from 100% machine spun wool thread, or from 100% hand spun wool thread or we can mix it - in warp and weft. We can weave wool, linen, silk, cotton, nylon ... and mix. Handwoven wool fabric - weight from 200 grams up to 580 grams per meter till now. Fabrics in 99% goes to people who use to sew historical costumes or other parts for historical reconstruction. 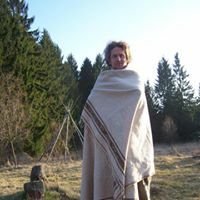 For me - wool is best for every day using as blanket, socks, ice braker Tshirt... - no chemicals, very warm and many more. We use to weave different types of blankets on order. Handwoven sheep wool blankets are without desing or with woven pattern...on order also.